60' x 20' High Peak Tent | FroggyHops.com Minneapolis MN. 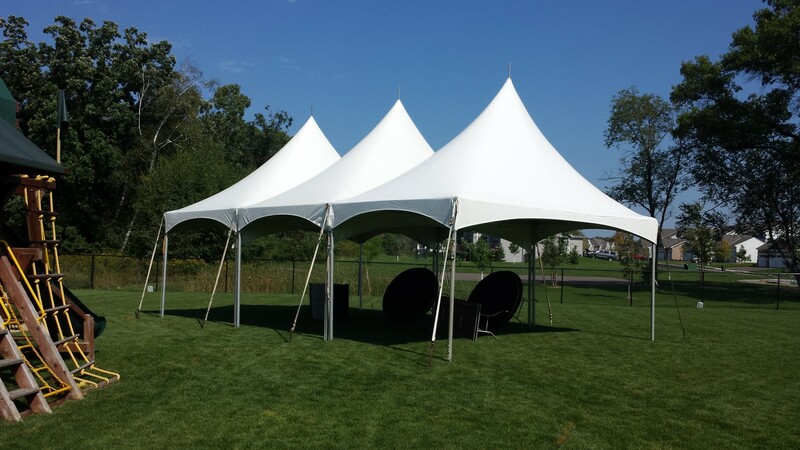 The High-Peak Tents offer a clean and classy look for all events from backyard graduation parties to weddings! Enjoy cover from the sun and rain with this 60 foot by 20 foot high peak tent. There are no poles down the center of the tent leaving the area open and clear for tables, chairs, or other needs. This tent is constructed with three smaller 20' x 20' tents, which allows freedom to place the tents together in a straight line, in an "L-formation" or in separate areas of the event space. When placed together, a rain gutter system is installed complimentary to ensure no leaks between the tents during a rain shower. Prices include set-up and take-down of the tents on grass. Asphalt set-up available. Please call for details.